I think most people are in favor of lawful, peaceful protests. However, in Ferguson, while some protests have been peaceful, others have not been peaceful. It’s now being reported that at least two protest leaders have become victims, not of the police, but their own neighbors. One woman had her car stolen while another had her home burglarized. Perhaps it’s time they got a wake up call. She protested at sports venues and attempted a banner drop. She co-led the St Louis Symphony interruption, was arrested at the pumpkin smashing, yelled at the St Louis Post Dispatch protest, and helped block traffic with her freakshow in Clayton yesterday. While yelling “F*ck the Police!” apparently her car got stolen. Does anyone assume that after her rant she dialed up the police to report the theft? Ms. Vega clearly believed that Brown was murdered by evidence of the tweets she sent out and retweeted. Now that justice has been served, she isn’t satisfied because it’s not the way she imagined justice would be. By the way, she did inform everyone that she got her car back. Twenty-year-old Alexis Templeton has been on the front lines of protests since she arrived in Ferguson, five days after Brown was shot. She is a member of Millennial Activists United, a group that was founded in the aftermath of Brown’s death to unify younger Ferguson residents who are fighting to make their voices heard. She says her fellow protesters have become her new family. Trying to create change in her community has become her everyday life. On November 18, Templeton tweeted out that her house had been looted. I’m ok. My grandma’s ok. The house is intact. A few things stolen, but it’s all good. Thank you all for the support. Do you think Ms. Templeton filed a police report? I’m guessing so. Again, consider what the protests have been about from the beginning. They have been about race, not really an unarmed young man being shot, whether in self-defense or not. They have been purely about race, and the race baiters and government provocateurs have been only too happy to descend on Ferguson and help ignite the fires, literally. 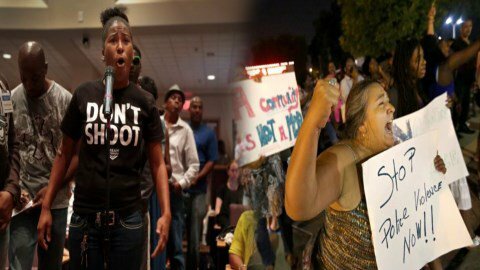 The question I have for Ms. Vega and Ms. Templeton is very simple, when will we see you begin to protest those that loot and damage property in the same manner and with the same energy that you have protested the death of a thug punk like Michael Brown? When will you begin protests against the real problem in your own community, your own people?